KOER REPORT: Bigger one, strength and substantial, impressively strong with good head and expression, pronounced Withers, firm back, good croup situation and - lengthens. Long, very Bigger one, strength and substantial, impressively strong with good head and expression, pronounced Withers, firm back, good croup situation and - lengthens. Long, very well angled upper arm, Strong hind angulation, clean front and signal element sequence, convincingly spaceseizing gait. Lively, safe nature, UCB pronouncedly; discharges. 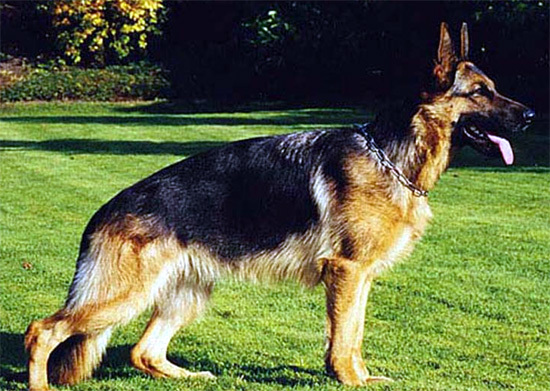 2003 Sieger show Report: After breed use matured. In very good condition one introduces.